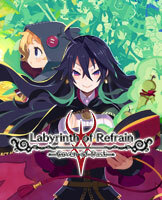 Labyrinth of Refrain: Coven of Dusk | NIS America, Inc. Dive into a massive labyrinth beneath the little town of Refrain. What secrets does it hold, and what truths will you uncover? Dive into the miasma-filled labyrinth as the Tractatus de Monstrum along with your brigade of puppet soldiers to smite monsters and uncover dark secrets. Strange creatures and traps of all sorts will stand in your path as you go deeper in the maze. Give orders to your army and crush them with special skills! Create your very own puppet soldiers, grant them a variety of different roles, and assign them to specialized squads to make your own unique brigade! ©2016-2018 Nippon Ichi Software, Inc. ©2018 NIS America, Inc. All rights reserved.